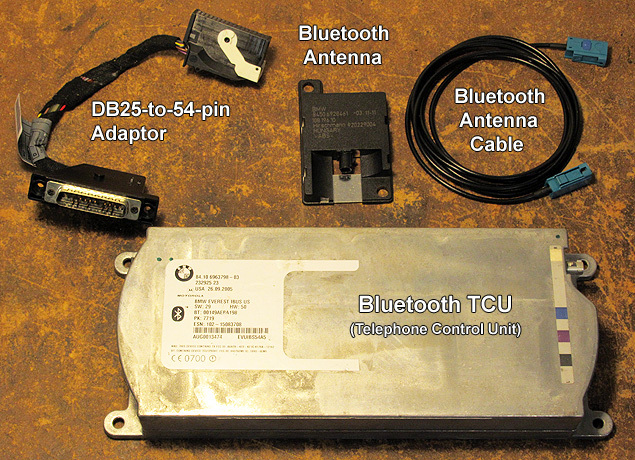 (1) BMW Bluetooth TCU: p/n varies, price (used): $100 - $150. (1) DB25 to 54-pin Adaptor Harness: p/n 84 12 0 308 375, price: $37 (list). 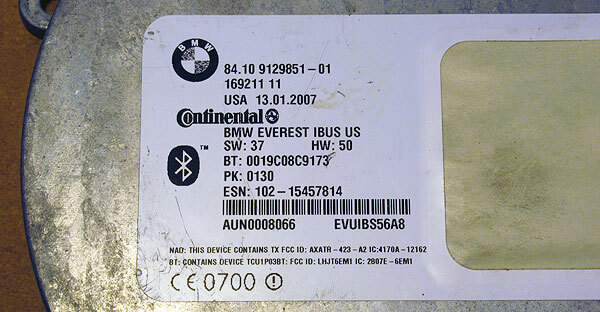 (1) BMW Bluetooth Antenna: p/n 84 50 6 928 461, price: $26 (list). (1) FAKRA Cable: 4' minimum length, price: $6-$12 (on eBay). Replacing the useless stock phone system in your BMW with a factory, hands-free "Bluetooth" system is a fantastic way to modernize your car, gain practical benefits and fully utilize your onboard electronics. Aftermarket BT devices (such as Grom and MediaBridge) require your radio to be continuously on and in CD mode in order to function. But a factory BT system operates independently, in the background and always at the ready. 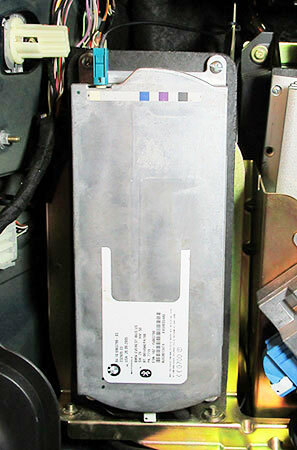 In addition, the CD changer line remains open (for use as an MP3 music source or aux-in, for example). So, you can finally use all your car's electronics including the built-in microphone (in the headliner) and steering wheel controls, plus view extensive phone information on your nav screen or MID display. What could be better?! ULF (Universal Phone Unit): Compatible with most BMW's regardless of installed electronics and model year; Requires phone pairing button; Accepts phone-specific cradles (in center of armrest) which charge your phone while boosting its signal thru the roof antenna; However, ULF's are expensive and hard to find; Requires more installed parts. TCU (Telephone Control Unit): Partially compatible with E38's thru 08/00 but fully compatible after that; No pairing button needed (pair within two minutes of starting your car); Can't use cradles; Cheaper and more numerous than ULF's; Fewer installed parts required. Considering cost, simplicity, and my car's model year, I chose to install a TCU. The good folks at BimmerNav are now offering a TCU kit, but it costs as much as their ULF kit: $800. As described here, a TCU retrofit can cost under $200. BMW made several different ULF's and TCU's over the years. Compatible TCU's were made starting in late 2004, with the most recent being p/n 84 10 9 195 455 (from 3/08 and still available from BMW). For a summary, see BMW TCU and ULF Part Numbers. Navigation voice control will be lost for E38's built before 08/00, unless an SES voice module is installed. If this is a deal-breaker, get a ULF instead. See step 8 below for more. From 08/00, voice control can be shared with navigation after simple coding with NavCoder software. See my NavCoder section for instructions. If your BMW is not equipped with DSP sound, you will probably need a supplemental amplifier if you cannot obtain suitable volume from your phone. While there is much variation in BMW models, the information here may be applicable to several BMW models from the late '90's-on. Look for the Bluetooth logo (left center) and "PK" (Pass Key) code. This code is required to pair your phone. If this label is missing or illegible, do NOT buy it! The two peel-off labels will most likely be missing. This is OK.
Verify "BMW....IBUS", as only i-bus units are compatible with the E38 7-series. The production date (above: January 13, 2007) will relate to the software and hardware version ("SW" and "HW", respectively). Look for late production dates to obtain the newest technology. The BMW cable which connects the BT antenna to the TCU (p/n 61 12 0 137 616) is a FAKRA-type cable and was discontinued on 6/3/16. Not to worry. This is a generic part and may also be purchased on eBay. You will need a female-female connection with 4' minimum length, in size RG174. The perfect location for the BT antenna is inside the left (driver-side) C-pillar, just below the passenger courtesy light. Running the FAKRA cable thru the trunk wiring pass-thru is surprisingly easy compared to some cars. Unfortunately, removing trim pieces for access will result in broken fasteners. The question is how many. Follow my instructions to minimize the damage. 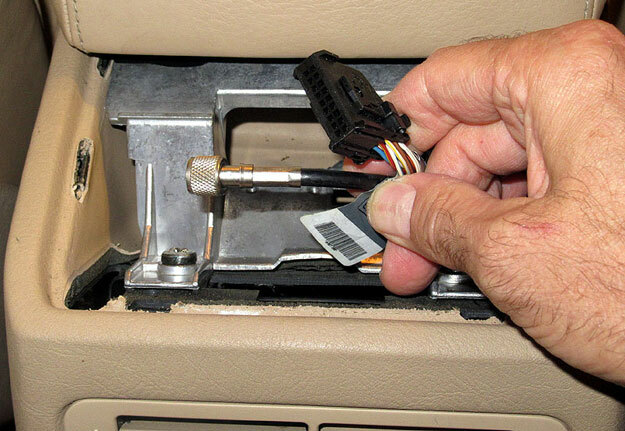 Unlike the ULF, a factory trunk mounting bracket is unavailable for a Bluetooth TCU in an E38 7-series. For those interested in a clean install (like me), a random tie-wrap solution is unacceptable. An adaptor board can be made from plywood, and mounted on the video bracket. Note the Bluetooth TCU is a large device. It's too big to fit in place of the old TCU. If mounted as suggested, it must sit as low as possible on the bracket. Even so, the TCU still contacts the taillight access door. Leaving this door ajar isn't an issue, since it's not visible after closing the larger nav access door. See Procedure sidebar below. Once free, disconnect the two plugs and antenna wire. Set aside. Then, remove the black plastic trim surrounding the bracket's opening. 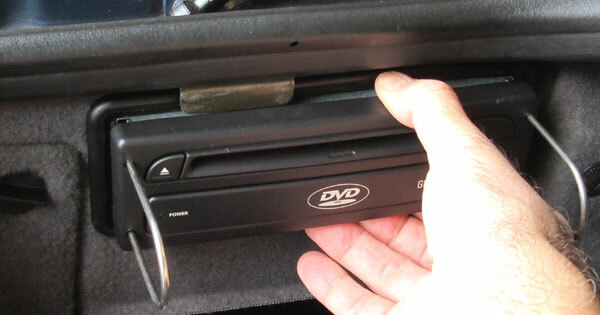 2) Release the two black plastic trim screws just right of both the nav and CD changer. 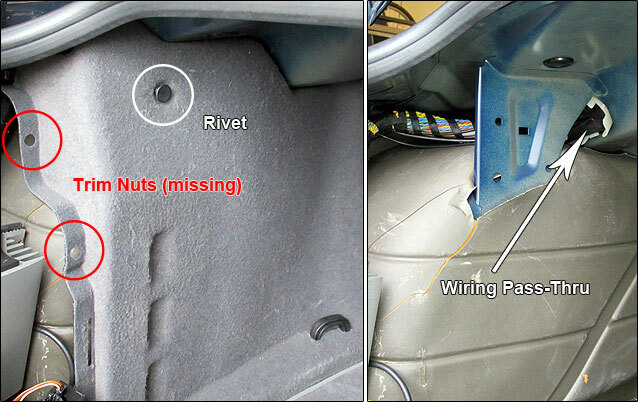 Then, release the 1/4 turn fastener securing the taillight access door (left of nav opening). Now, remove left rear side trim by pulling out and up. 3) Pull out upper rivet on forward trim. 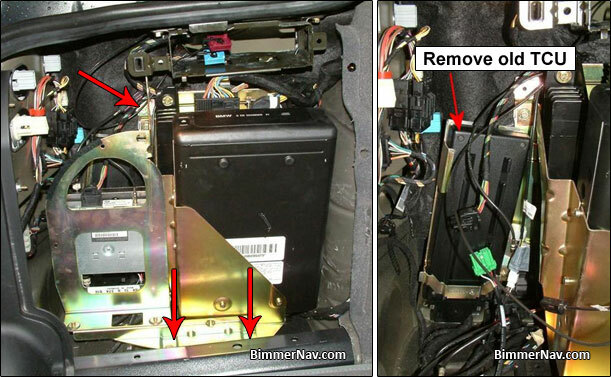 Then, pull trim down to gain access to trunk wiring pass-thru (images above). Those black plastic fasteners are the dumbest thing BMW has ever invented. The plastic nut on the other end almost always turns with the screw, making it impossible to release. And the nut can't be held in place 'cause it's behind the trim...leaving your only option to break off the screw. Even if you release a screw, installation is worse. Try positioning the trim while turning the screw: the nut will either fall into oblivion or turn like a pinwheel. This is why most screws have missing nuts and aren't functional anymore. I know of no good substitute parts. 6) Survey your installed equipment. 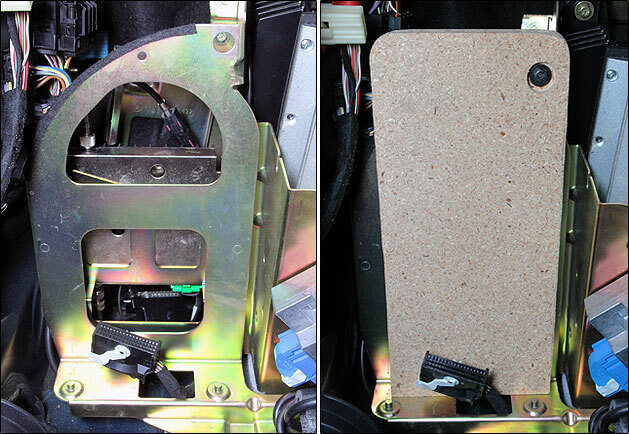 Remove your old TCU and associated phone parts from both the trunk and center armrest (if any). Install blank center tray in armrest to replace any existing phone cradle. Your old TCU is likely behind the brass-color video bracket. 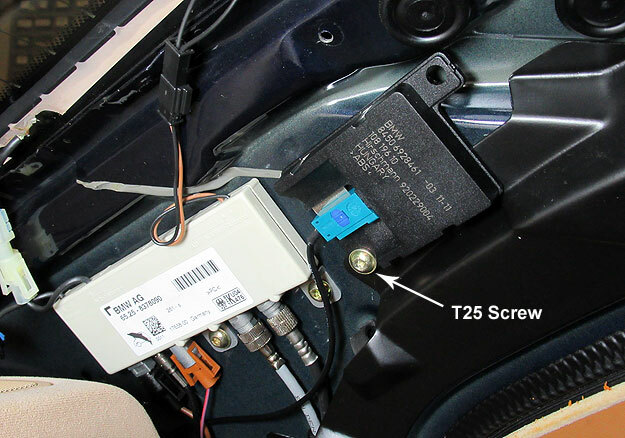 Remove the three 8mm screws to release bracket, as shown in image above left (red arrows). Unplug old TCU and discard. (Don't bother listing it on eBay. It's worthless.) Newer cars may have TCU mounted in front, directly on video bracket, as in image below. 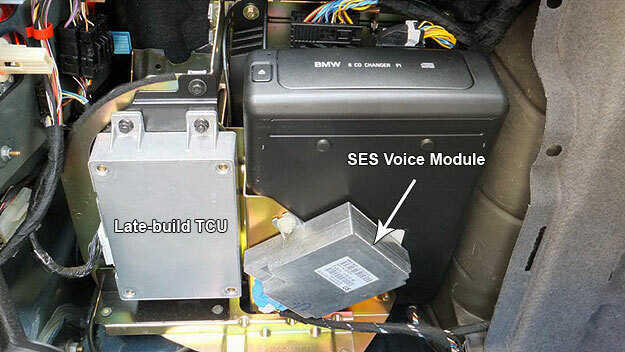 For late-build models, note also the SES voice module in image above. This module will handle voice control of both Bluetooth TCU and navigation (after NavCoder programming of TCU). Cars without SES will lose voice control for navigation after Bluetooth TCU installation -- unless an SES module is installed. See note to step 8 below. The pinouts on this black connector are very small and difficult to read. Use a magnifying glass for assistance. 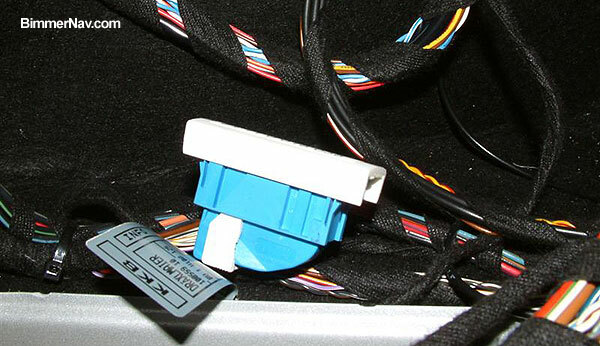 NOTE: Installing an SES voice module in a car that did not come with one should enable voice control of both nav and notepad, along with phone, all without jumpering pins 11/14 in the armrest plug, as noted in this thread. 9) OPTIONAL (if necessary): Prepare new TCU and BT antenna for the FAKRA cable by filing off keyed metal ends of white coded connector of TCU and the black plastic keyed ends of BT antenna. 11) Mount Bluetooth TCU and connect 54-pin adaptor. One mounting option is to tie-wrap it to the video bracket. A better solution is a plywood mounting board which attaches to the video bracket. See image above right and sidebar below. Using thick 5/8" plywood or similar, cut a piece 5" x 11.5". Round off the upper corners to prevent cuts & bruises when reaching in to change a rear light bulb. Spray-on flat black paint for a finished look. With the board resting on bottom of bracket, mark the bracket attachment point in upper right corner. Drill a hole for a screw/clip or nut/bolt combo and countersink it using a 3/4" bit. (TCU will rest over this area.) A drill press is helpful for accuracy. On a workbench, place TCU at the top of board and mark the four TCU screw locations. Drill four pilot holes sized for short, thick screws. 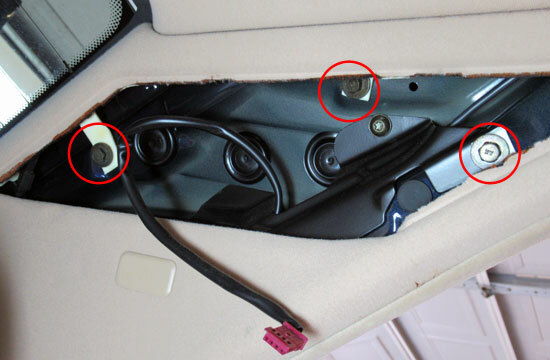 12) Insert coat hanger wire (or similar) in trunk pass-thru grommet, up into C-pillar area. Tape FAKRA cable to the wire and pull it back through into trunk. 13) Route FAKRA cable safely behind trunk electronics and connect to white coded terminal of mounted TCU. E38's thru 08/00 (without nav or SES module): Confirm voice recognition ("VR") is enabled (most TCU's come this way). Set emergency call number (if desired). E38's from 09/00 (with nav): Disable voice recognition (switch to SES). Set emergency call number (if desired). E38s without voice recognition, built between 3/96 - 9/99, can obtain it by swapping steering wheel butons. Right: note phone icon (panel A) vs voice icon (panel B) on bottom button. In fact, phone buttons have been discontinued and superseded by voice, p/n 61316903396 (about $50 used). The significance of this is now all cars can use the voice recognition features of a factory Bluetooth TCU! Because TCUs have an independent voice-activated phonebook, separate from your phone. Using the built-in microphone, you can record "voice tags" of commonly called numbers, allowing you to place calls by voice command instead of manually selecting them from either your phone or your phone's paired directory (displayed on nav/MID). And also because system volume (as opposed to phone volume) can only be controlled by voice command. What a cool way to bring your E38 into the 21st century! BMW Bluetooth User Manual - for ULF installations, but mostly applicable. BMW Voice Control User Manual - make use of the separate voice-activated phonebook! Bluetooth Telephone Menus - my supplement for cars with navigation. Microphone, p/n 84 31 6 938 762 - new, noise canceling voice mic (optional). Now place a Bluetooth call to celebrate! New Mic '762: I do not recommend this mic over stock simply because its noise-cancelling features cause audio cut-out upon low signal levels. This results in a completely silent "lost-signal" sound for the caller during conversational pauses, which leads to questions "...you still there?". To be heard better during a call, lean in towards the mic. Audio/Volume: There are two different ways to control in-call volume: 1) phone, 2) system. System volume is only accessible by voice command, but not during a call. It has only three pre-sets: low, medium, high. System volume also sets the incoming call alert tone. A "high" tone can be quite startling when receiving a call. Furthermore, adjusting radio volume during a call has no affect. This leaves phone volume as the only effective volume control when in-call. To offset road noise, tighten the Speed Dependent Volume steps (SDV) when coding your TCU. See my NavCoder section for details. Update (11/17): Since installing this TCU (software version 29) in my E38 last January, I have encountered occassional phonebook pairing problems and slow-to-pair behavior with my old Andriod phone. Address book pairing is a known problem with some older TCU's. Update (10/18): After almost 2 years of use, I had to replace my previous TCU after it suddenly stopped working (locked-up audio system and froze nav screen). The newer unit (software version 37) provides noticable improvements. Phone and address book pairing are immediate, and nav screens respond quickly. So far, I'm very pleased. I now recommend SW versions above 29 (see your TCU label).